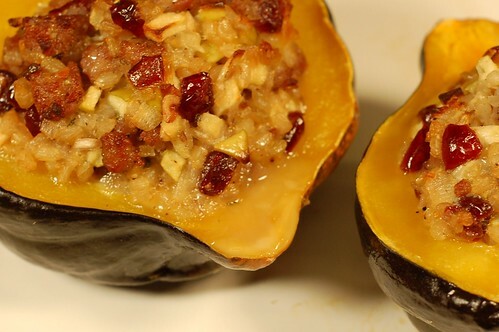 Acorn squash requires a bit more cooking time than delicata so you will need to pre-bake before stuffing. I recommend baking in a pan with a little water to help keep the flesh moist as it cooks. 1. Preheat oven to 350°. Rub a little olive oil over the cut surface of each squash half and place, cut-side down in a 9- by 13-inch baking pan. Pour an inch or two of water into the pan and bake until tender when pierced with a fork, 35-45 minutes. 2. Meanwhile, cook the sausage in a frying pan over medium heat until it is crumbly and lightly browned all over. Put the meat aside and use the fat in the pan to sautee the onions until translucent, 5 to 7 minutes. Add the apples, cranberries or raisins, and sage; stir often until apples have softened. Transfer to a bowl and add the sausage, rice, salt and pepper. Mix in the eggs and stir well to combine. 3. 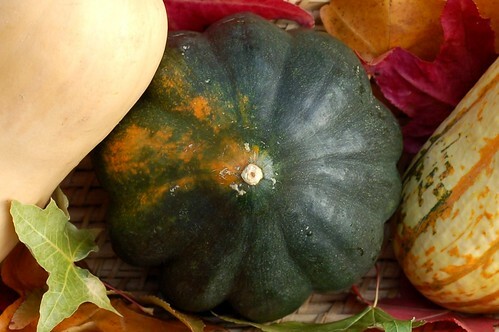 Remove the cooked squash halves from the oven, empty the baking dish of any leftover water and place the halves back inside turned upright. Fill the halves equally with the stuffing mixture and drizzle with maple syrup. Bake, uncovered until the filling is slightly browned on top, about 15 minutes longer.